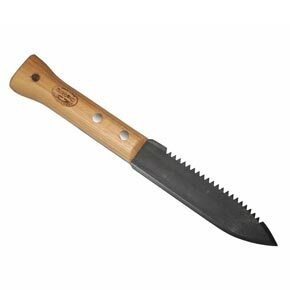 This heavy duty all-purpose garden knife can cut through any gardening chore with ease. Its serrated edge is perfect for chores like cutting open bags, weeding and transplanting while its pointed edge works like a garden spade. Constructed of hand-forged, tempered boron steel, the 5 mm blade is guaranteed to last a lifetime. The strong but lightweight European Ash hardwood handle comes from FSC (Forest Stewardship Council) certified forests. 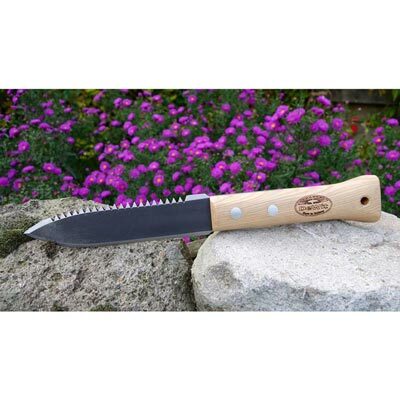 Built to last, this Serrated Farmer's Dagger is a favorite in the garden and also makes a great gift for your gardening friends. Made in Holland. Head: 5"L. Total: 16"L. 0.85 lb.